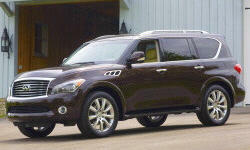 12/01/14 Nissan north america, inc. (nissan) is recalling certain model year 2013 infiniti qx56 vehicles manufactured september 1, 2012, to april 26, 2013, and 2014 infiniti qx80 vehicles manufactured june 18, 2013, to february 11, 2014. in the affected vehicles, the driver's frontal air bag inflator may have been manufactured with an incorrect part. Nissan will notify owners, and dealers will replace the front driver air bag inflator, free of charge. the recall began on december 1, 2014. owners may contact nissan customer service at 1-800-647-7261. 03/22/10 Nissan is recalling certain model year 2008-2010 titan, armada, and infiniti qx56, and model year 2008-2009 nissan quest vehicles. the brake pedal pivot pin end was not spin-formed to specification during the manufacturing process of the brake pedal assembly. the pivot pin could slide and cause the brake pedal to partially disengage from the brake pedal bracket. 01/25/15 Engine Nissan north america, inc. (nissan) is recalling certain model year 2012-2014 nissan juke, 2012-2013 infiniti m56, qx56, and 2014-2015 infiniti q70 (v8 engine vehicles only), and qx80 vehicles. the fuel pressure sensors may not have been sufficiently tightened during production. as a result, the fuel pressure sensor may loosen with vehicle usage and cause a fuel leak. 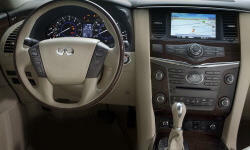 04/02/12 Engine Nissan is recalling certain model year 2011-2012 juke, infiniti qx and infiniti m vehicles. the fuel pressure sensors may not have been tightened to the correct specification. as a result, the fuel pressure sensor may loosen due to heat and vibration causing fuel to leak. 12/06/10 Engine Nissan is recalling certain model year 2004-2006 armada, titan, infiniti qx56 and model year 2005-2006 frontier, pathfinder and xterra vehicles. the intelligent power distribution module (ipdm) assembly contains an engine control module (ecm) relay that has a diode for electrical current noise reduction. the ecm relay may allow silicon vapor to form and, over time, the silicon evaporates from the diode molding which causes silicon oxide to develop on the ecm relay contact due to arcing. 05/20/10 Suspension and Steering Nissan is recalling certain model year 2010 titan, armada, qx56, frontier, xterra, and pathfinder vehicles manufactured from november 19, 2009 through march 3, 2010. the lower control link assembly has two cylindrical collars forming the inboard attachment points to the chassis. due to an improper welding process some collars may contain welds that do not meet strength specifications. 08/16/10 Electrical and Air Conditioning Nissan is recalling model year 2008 nissan armada and infiniti qx56 vehicles manufactured from february 7, 2007 through february 14, 2007. these vehicles fail to comply with the requirements of federal motor vehicle safety standard no. 201, "protection in interior impact." an out-of-specification a-pillar finisher might impede the correct inflation of the side curtain air bag near the upper portion of the b-pillar. Incorrect inflation of the side curtain air bag may increase the risk of injury to a vehicle occupant in the event of a crash requiring deployment of that air bag. Dealers will replace both right and left front pillar finishers free of charge. the safety recall began on august 16, 2010. owners may contact nissan at 1-800-647-7261. 08/02/08 Electrical and Air Conditioning Nissan is recalling 180,664 my 2005-2006 titan, armada and infinity qx56 vehicles manufactured after march 17, 2005, that are equipped with a visteon air conditioning condenser fan motor. the fan motor may not be properly sealed allowing excessive water intrusion and inadequate drainage of moisture.